The city of Hoboken has become a coveted home for those who wish to have direct access to New York City, but do not want to live there full-time. The highlight and second biggest draw of Hoboken is the dramatic view of the Manhattan skyline that can be seen from each of the city’s piers. Hoboken Wedding Photos are often taken on the piers for this reason. The Hoboken Wedding Photos that I took of this couple on Pier C captured these incredible views as well as the emotions of the wedding day. This image shows the bride walking coyly toward the groom in a state of amazement, preparing for their first look before the wedding ceremony. A first look photo is becoming more and more common, as couples find that they like having a more private setting in which they first see one another dressed in their wedding day finery. It is the moment that the wedding day truly becomes a reality for the bride and groom. A first look picture gives the couple a chance to just breath and be with one another before they become swept up in the events of the day. This couple’s first look picture series was taken with the Hudson River and the NYC skyline as a backdrop. 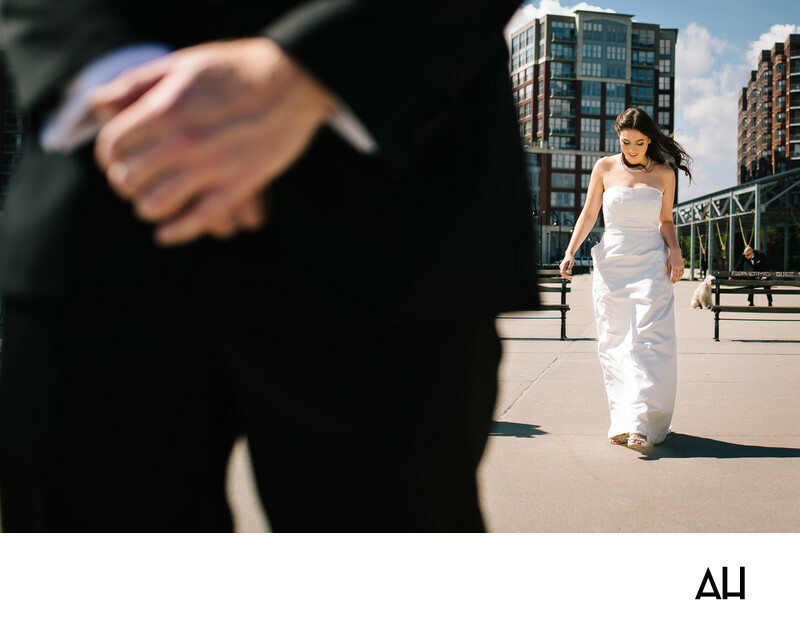 This particular photograph, however, focuses on the steps the bride takes as she walks toward her love. Behind her, a groomsman holds onto the couple’s dog, who they requested be present for the pictures. The pup waits patiently as his mom and dad share this time alone. Wind blows through the bride’s loosely curled hair and peep toe wedge shoes peek out from under her gown as she takes each step forward. The image captures a feeling of wonder and of anticipation, for this moment and for all of the moments to come.